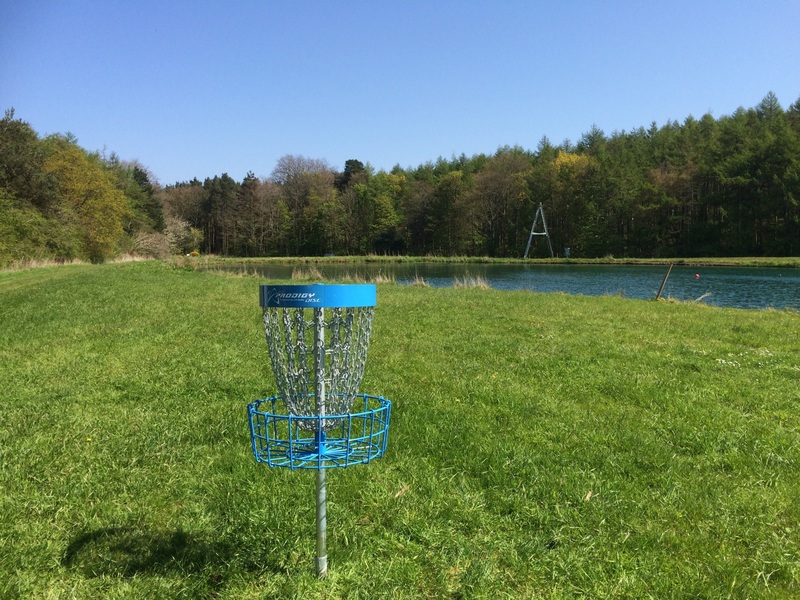 The PA series Putt and Approach discs are extremely reliable short-range disc golf discs. All the PA series Putt and Approach discs are designed with a specific function in mind so that whatever angle you need to take to get to the basket one of these discs will get you there. The PA1 is a Putt and Approach disc. This Putt and Approach disc is designed to be over stable. The consistent flight path of this disc makes it a favorite of disc golfers looking for consistency and reliability in all wind conditions. The PA2 is a Putt and Approach disc. This Putt and Approach disc is designed to be stable to over stable in all wind conditions. The consistent flight path of this disc makes it extremely reliable in all wind conditions. PA4 is an under stable Putt and Approach disc. It is designed for all players and skill levels. The PA4 will turn up when thrown hard and will then have a long glide and gentle turning finish. The M Series Midrange are extremely reliable mid distance disc golf discs. All the M series discs are designed so that the flights are extremely consistent making them the favorite choice of the top rated players in the world. The M1 is an extremely reliable mid range driver, designed to be over stable with incredible consistency and control. The M1 mid range is good for all conditions and flies as well into the wind as it does with the wind. The consistent flight path of this disc makes it a favorite of the top rated players in the world. M2 is an extremely reliable mid range driver, designed to be slightly over stable with incredible consistency and control. The M2 mid range is good for all conditions and flies as well into the wind as it does with the wind. The consistent flight path of this disc makes it a favorite of the top rated players in the world. M3 is an extremely reliable mid range driver, designed to be stable for moderate power throwers and for players who need a disc that will finish left (right handed throwers) with incredible consistency and control. 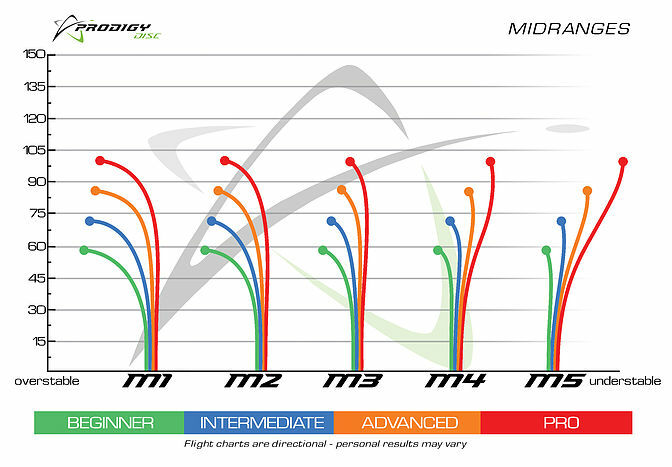 The M3 mid range is good for all conditions and flies well in all wind conditions. The consistent flight path of this disc makes it a favorite of the top rated players in the world. M4 is an extremely reliable under stable mid range driver. It is designed for all players and flies extremely far for a mid range. The M4 will turn up when thrown hard and will then have an extremely long glide and a soft straight finish. It is a favorite of the top pros who need to throw controlled long straight shots. OUT OF STOCK M4 is an extremely reliable under stable mid range driver. It is designed for all players and flies extremely far for a mid range. The M4 will turn up when thrown hard and will then have an extremely long glide and a soft straight finish. It is a favorite of the top pros who need to throw controlled long straight shots. The M5 is the least stable of the Prodigy Mid Range discs to date. This is a great all round disc for highly skilled players and for people just learning the game. This disc will flip up when thrown hard and turn right. The A Series Approach discs are extremely reliable short to medium distance discs. All the A series discs are designed so that the flights are extremely consistent in any conditions. The A1 is an over stable utility disc that fills the gap between midranges and putters. The A1 is perfect for power throwers who want to avoid the possibility of their shot turning over. The disc is consistent and reliable in all wind conditions and perfect for short, trick shots as well as high wind approach shots. The A3 is a stable utility disc that fills the gap between midranges and putters. The A3 is perfect for strong to above average throwers who want to avoid the possibility of their shot turning over. The disc is consistent and reliable in all wind conditions and perfect for short, trick shots as well as high wind approach shots. The A3, like the A1 is also beaded. The A4 is a stable disc that fills the distance gap between midranges and putters and is designed for all skill levels. The disc is consistent and reliable in moderate wind conditions and perfect for short approach shots. It works equally as well for backhand or sidearm throwers. The A4, like the A3 has a bead on the rim. You can expect it to fly slightly less stable than the A3 with an extra 40-50 feet in distance. The F Series Fairway Drivers are long flying, extremely reliable golf discs. Each fairway driver has been designed with a specific flight path in mind and all feature our trademark "Easy Release Technology." 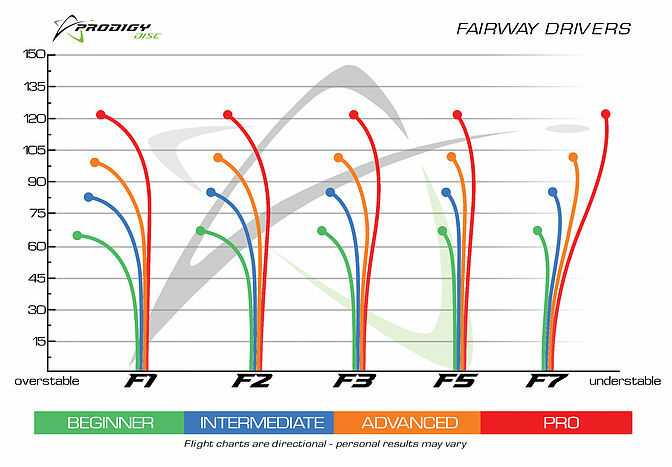 F1 is a medium speed, significantly over stable fairway driver with very predictable and controllable flights and a strong finish. It is designed for power throwers. This disc is also an excellent choice for thumber and tomahawk shots. The F2 is a medium speed, over stable fairway driver with very predictable and controllable flights perfect for executing the most demanding shots. The F3 is a stable fairway driver for long, controllable flights with a mild finish. It is a great disc for all skill levels. The F7 is a medium speed, under stable fairway driver with substantial glide. It is a great choice for recreational and beginner players. It is also excellent for turn shots and rollers. 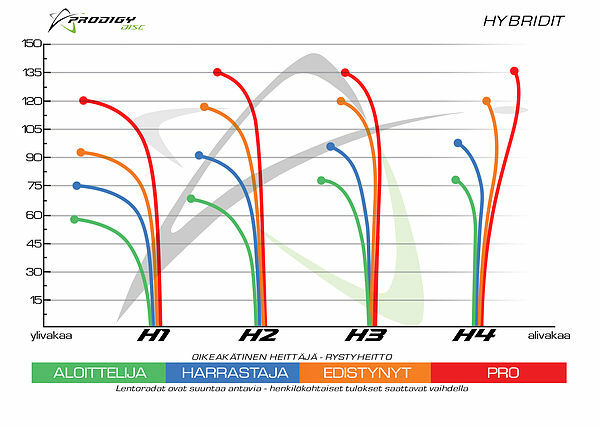 The H Series is new class of Hybrid Drivers. The H Series discs will eventually be available in a range from H1-H4. 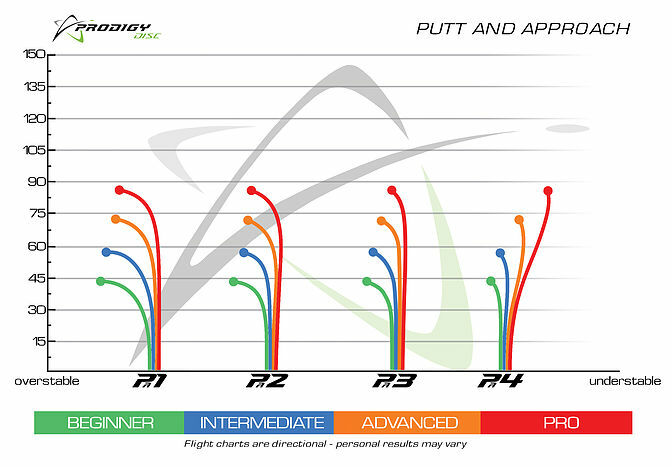 The H Series will be longer and faster than our Fairways but slower and more accurate than our fast flying Drivers. Produced in our 750 plastic, the H2 is an over stable hybrid disc with a little less stability and more glide than the H1. The H3 is a stable to slightly over stable hybrid disc with a little less stability and more glide than the H2. Produced in our 750 plastic, the H4 is the latest in our H Series hybrid discs that fall perfectly between our distance and fairway drivers. The H4 is a less stable hybrid with considerably more glide and a softer finish that its predecessors.The H4 will hyzer flip to flat, fade slightly to the right, and then finish left. The D Series Drivers are extremely reliable long distance disc golf discs. 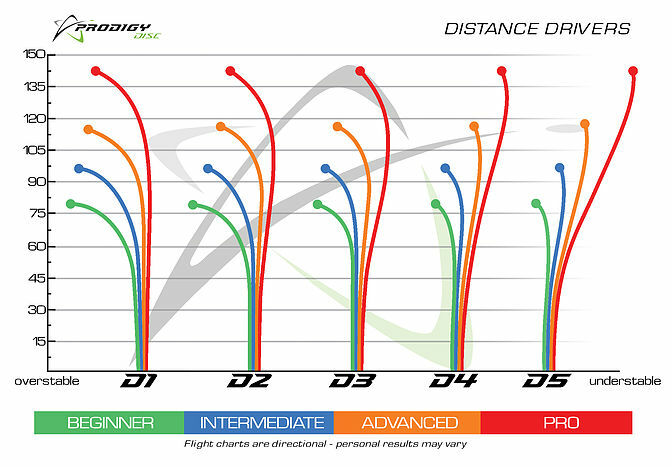 All the D series drivers are designed so that the flights are extremely consistent with a narrower flight path than conventional long distance disc golf discs making them more accurate and much more forgiving. The D1 is a very fast, over stable driver designed for power throwers. This driver is good for all conditions and flies as well into the wind as it does with the wind. The consistent flight path of this disc makes it a favorite of disc golfers looking not only for a long flight but pinpoint accuracy. The flight path is similar regardless of the weight. 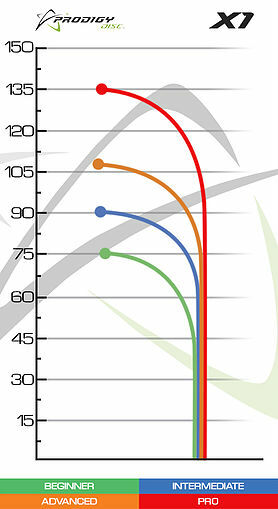 is a very fast, over stable driver designed for power throwers. This driver is good for all conditions and flies as well into the wind as it does with the wind. The consistent flight path of this disc makes it a favorite of disc golfers looking not only for a long flight but pinpoint accuracy. The flight path is similar regardless of the weight. D3 is a very fast, moderately stable driver with a unique flight path. It is designed for all players and flies extremely far. What separates the D3 is its ability to flip up and then glide without the extreme drift to the right or the hard finish back to the left. .D4 is a very fast, under stable driver. It is designed for all players and flies extremely far. The D4 will turn up when thrown hard and will then react similarly to the D3 with its long glide and gentle turning finish. D4 is a very fast, under stable driver. It is designed for all players and flies extremely far. The D4 will turn up when thrown hard and will then react similarly to the D3 with its long glide and gentle turning finish. The D5, is produced with our 400 series plastic and is the most under stable of all of our drivers to date. It will hyzer-flip and end with a smooth right to left roll. The D6 is a very fast, under stable driver. It is designed for all players and flies extremely far. The D6 will flip up when thrown hard, turn towards the right (for right handed throwers) and then go into an extremely long glide, with a gentle draw finish to the left. The D6 is also a great disc for long controlled rollers. The Prodigy X1 is an extremely over stable high-speed driver. It was designed for the strongest throwers and can withstand the highest wind conditions. When you absolutely need an over stable flight into a stiff wind the X1 is the Disc for you. The X1 is also very effective for sidearm and overhand shots. The Prodigy X1 is an extremely over stable high-speed driver. It was designed for the strongest throwers and can withstand the highest wind conditions. When you absolutely need an over stable flight into a stiff wind the X1 is the Disc for you. The Prodigy Disc X2 is a consistent, long flying, over stable distance driver designed for any skill level. Players who are looking for a solid distance driver in windy conditions or long, right to left hyzer shots will feel that the X2 fits perfectly in their lineup. The X2 will be a go-to for top professionals looking for a reliable finish on their long drives and will be an accurate right to left distance disc for those with lower arm speed. For fans of the X1, the X2 matches in consistency but exceeds in speed and glide. The Prodigy Disc X4 is a slightly understable, low profile, high speed distance driver. It is great for players with lower arm speed that are looking to gain more distance. The X4 is designed to hold a turnover even at a lower speed. The X4 performs very well at low heights and in tunnel shots. For players with faster arm speed, the X4 will flip later in the flight path, and is perfect for long wooded shots or accurate turnovers. Perfect for the player that doesn’t want to carry a heavy bag! Our compact and high quality golf bag holds up to 8 Prodigy discs. Water resistant, padded and adjustable strap, putter pocket, water bottle holder with drainage hole. Two zippered compartments and one easy access pocket, ideal for a cell phone. Are you cool enough? These are very comfy hats. ​BP-3The Prodigy BP-3 Backpack sets a new standard for lightweight and compact, with all the necessary features of a great disc golf bag. The BP-3 can carry up to 17 discs, has a deep putter pocket, water bottle holder, a side zipper pocket for valuables and reinforced, padded straps. A great bag at the best price. Energy is valuable, don’t let your bag use it all up. The Prodigy BP-2 Backpack is extremely light, yet allows you to carry approximately 25 discs and so much more. Secure your seat, and clip on a towel & bag tag to the multi-functional accessory strap. Access your putters with ease from the top putter pocket, and keep your valuables safe in a dedicated microfiber-lined compartment. Redesigned back straps help distribute pressure more evenly, keeping you on top of your game round after round. Our unique 30 chain configuration, with 3 sets of horizontal chains, is the most effective way to eliminate the disc from passing through the target. This set of chains also prevents the disc from hitting the pole, all but eliminating the chance to bounce back towards the thrower. The target is visually appealing, with a powder coated top band and basket. Its solid construction exceeds all the specifications required by the PDGA to be called a “Championship Target". Not only does it look great, and catch better than any target on the market but it also features the trademark “Strike Zone”. The "Strike Zone" is a square created by the inner chains that makes focusing on the target easier. No more fear of a rejected putt. Putt with confidence in the T1.